Have you heard of Hiyak? Neither had I, until two lovely little parcels of Hiyak sirloin from Lanark County’s Tiraislin Fold showed up in my Farmers’ Feast basket, courtesy of the Ottawa Farmers’ Market. It’s a cross between Highland cattle and yak; the sirloin cuts were lean with just a nice touch of marbling throughout. 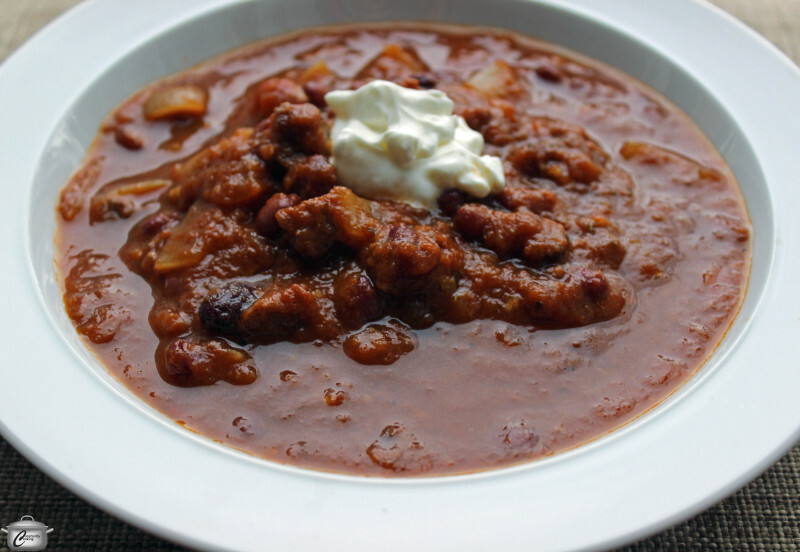 I decided to transform the meat into a household favourite – Texas-style chili. What differentiates most Texan chili recipes is that cubes of meat are used instead of ground; typically beef but occasionally pork. Onions are a must; I used the biggest shallot I’ve ever seen, from Roots Down Organic Farm. While some purists would argue that tomatoes and beans don’t belong in Texas-style chili, I put them in because I love them…and because I had beautiful black turtle beans from Jambican Studio Gardens and roasted tomatoes from Bryson Farms in my bountiful basket. A packet of Applewood chips from Hall’s Apple Market sealed the deal on making my first-ever smoked chili; it’s an experiment I will definitely be repeating. Smoking the meat prior to making the chili gave this version a great added depth of flavour. Soak the black turtle beans overnight in 2 cups of water. Soak the wood chips for 30 minutes in a bowl of water. Drain the water off the soaking beans and transfer the beans to a small saucepan with 2 cups of fresh water. Bring to a boil and cook over medium-low heat for 30 – 40 minutes, until beans are tender. Drain and set aside. While the beans are cooking, drain the wood chips and transfer to a sheet of heavy-duty aluminum foil; fold up edges to make a packet. Pierce holes all over the top of the packet. Place directly on top of burner of gas barbeque and preheat barbeque to very hot. As soon as packet begins to smoke, reduce heat in barbeque to medium-low (or, if possible, leave burner under packet on medium-high and turn off other burners). Put hyak or beef on the grill as far from the heat source as possible; close the barbeque lid and leave meat on until packet stops emitting smoke (probably about 30 – 40 minutes). Remove meat from grill and slice into 3/4 inch (2 cm) cubes. In a large saucepan, heat 1 tablespoon of the canola over medium heat; add meat cubes and cook till browned on all sides. Transfer browned meat to a bowl; add remaining oil to the same pot. Add onions and cook, stirring often, for 2 minutes. Add garlic and continue cooking for 2 minutes more. Return meat and accumulated juices to the pot. Add tomatoes, seasonings and 1/2 cup (125 mL) of beef broth to the meat; stir to combine well. Cook chili for 1 hour, adding more broth as needed to achieve the consistency you prefer. Add cider vinegar to taste, salt and pepper. Let sit for at least an hour before rewarming and serving. Like most chilies, it’s even better the next day. Serve in warmed bowls with a dollop of sour cream.